The term “like a pakapu (or pakapoo) ticket” means that something is indecipherable or untidy. Pakapu tickets were introduced by the Chinese to Australia and New Zealand in 19th century when many Chinese people immigrated to the gold fields. The sale of these gambling tickets caused great angst among the largely protestant population. This 1905 case (the text of which is provided due to poor image quality) had a (mostly) happy ending for the defendants. Tho Balmain Police Court was crowded yesterday morning, in anticipation of the Chinese who were arrested on Saturday last for selling pakapu tickets being dealt with. Seven of those for whom warrants had been issued were secured, and these were formally charged with selling tickets in an unlawful game. Mr F S Isaacs SM, presided. Mr D’Arcy Irvine instructed by the Crown Solicitor, prosecuted on behalf of the Crown, and six of the accused were defended by Mr Clark, and the seventh man by Mr Reeder. At first Mr Clark took a technical objection to the information but Mr D’Arcy Irvine pointed out that this was scarcely what he expected would happen. Representations had been made to the Crown Solicitor that the Act had only come into force on December 9 while the prosecution was initiated on the 15th. The Chinese, it was urged, had started these ticket shops when it was perfectly lawful to do so, and had received no notice to discontinue selling the tickets, and under the circumstances it was suggested that a nominal penalty would meet the case. The Crown Solicit0r had acquiesced in that view, and now this technical point was sprung upon him. If it were pressed he would take out fresh informations, and ask that the highest penalty should be inflicted. Mr Isaacs thought the accused ought to have been warned. After a consultation between the solicitors, Mr Clark stated that he would withdraw his objection, and plead guilty on behalf of the six accused. Mr Isaacs said he thought the accused were not aware that the law had been altered. The High Court had held that it was not unlawful to sell these tickets, but since then a new law had been passed rendering any person so doing liable to six months’ imprisonment without the option of a fine. Under all the circumstances, he would impose a merely nominal penalty, and that was imprisonment until the rising of the court. The seventh man was then brought in, and Mr Reeder said he could prove that the accused was not the man who sold the tickets at all; it was a case of mistaken identity. Mr Isaacs said he could not help that – it had been agreed that they should all plead guilty. This man was also sentenced to imprisonment till the rising of the court. During the progress of the case it was stated that all the shops had been closed. 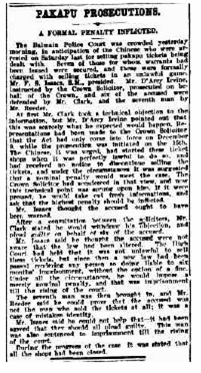 A Melbourne court case was reported in the Sydney Morning Herald on 22 July 1908. 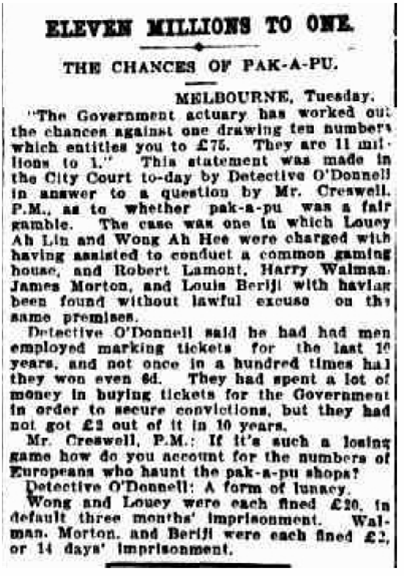 This is one of many newspaper reports of police and citizens attempting to rid the cities of the ‘ills’ of this gambling practice. Detective O’Donnell said he had had men employed marking tickets for the last ten years and not once in a hundred times had they won even 6d. They had spent a lot of money in buying tickets for the Government in order to secure convictions, but they had not got 2 pounds out of it in 10 years. So was it a case of ineffective policing, or something else? 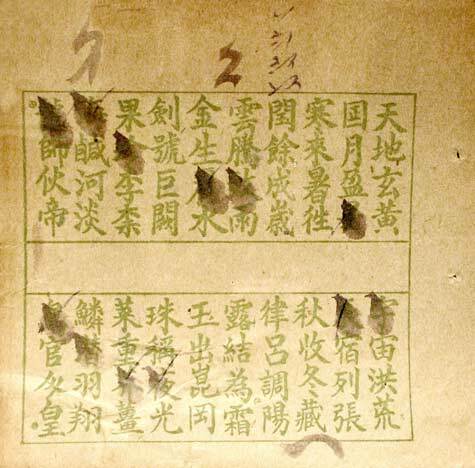 This image of a pak-a-pu or pakapoo ticket comes from The Encyclopedia of New Zealand. The tiger’s mouth has more detail on pakapoo tickets and their place in the history and heritage of Chinese Australia.